Lawson Home Services offers free estimates for a broad range of energy efficiency and home comfort savings and improvements. 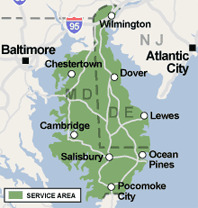 They service throughout Delmarva including: Wilmington, Bear, Newark, Dover, Easton, Berlin, Salisbury, New Castle, Seaford, Hockessin, Middletown, Cambridge, Stevensville, and more! We all want to save money, lower our expenses, and increase cash flow. Dr. Energy Saver can drastically lower your electric bill and reduce your home’s energy usage. From home insulation, to windows, to your heating and cooling systems, we can tell you exactly which parts of your Delaware home have the highest impact on your monthly electric bill, and the steps you can take to improve them. Dr. Energy Saver's mission is to make home energy savings affordable and accessible to homeowners in Delaware. Choose from our dealers above or contact us today to get started 1-888-914-4171. Dr. Energy Saver Dealers have been creating home energy solutions for years and have a track record of happy, satisfied homeowners who can see the difference in their lower energy bills and feel the difference in their more comfortable homes. The patented & proven solutions we offer for your home and the customer experience we provide has resulted in numerous industry & customer service awards. We treat your Delaware home as our own making the the right changes to improve it. By Melissa & Fernando D.
"Mike and the team worked great. Communication was wonderful, with great..."
By Jo & Leroy P.
"Sean and Harry did a great job, professional, courteous, and informative." Sean and Harry did a great job, professional, courteous, and informative. "Everyone who has been out to work on the house has been great. Thanks..."
Everyone who has been out to work on the house has been great. Thanks Bubba! "I'm sorry I could not name each and every crew member to give them credit..."
Cannot be any happier and pleased with Dr. Energy Saver. "Harry and his crew were very efficient and kept me informed of progress." Harry and his crew were very efficient and kept me informed of progress. By Kenneth & Virginia C.
"Outstanding job. Men worked hard! Very professional, very nice to work..."
"The crew was timely, polite and hardworking. They showed me all the work..."
The crew was timely, polite and hardworking. They showed me all the work step by step with before and after photos. They adjusted the vent in my daughter's room so it is now quiet and better balanced. Worked hard and space looked good.